The World Food Championships is the largest competition in Food Sport, where grand champions of previous events convene for a chance at winning the ultimate food crown and a share of hundreds of thousands of dollars in prize money. The World Food Championships is also the springboard for many up and coming culinary stars and home cooks as they seek TV fame through many well-known food shows and acting opportunities. Now that the dust has settled for the 6th Annual World Food Championships, the results are in! The 2017 WFC boasted the largest Food Sport tournament in history with well over 1500 contestants on 449 official teams. They came from 42 American states and 13 countries to compete, while more than 30,000 foodies watched and enjoyed the heat of the battle unfold in 10 official categories. 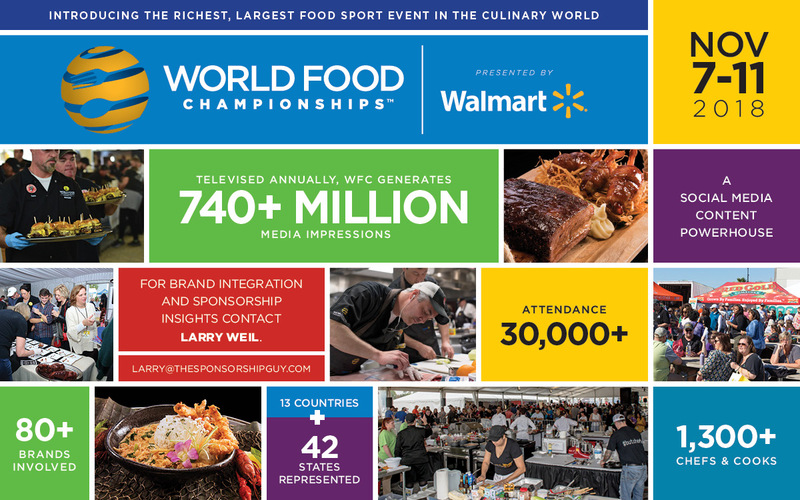 Since its debut in 2012, WFC has given birth to 30 TV food stars, awarded more than $1.5 million in prize money, garnered more than 5.7 billion media impressions, and connected 150+ food brands with food fans, food bloggers, and food media. In short, it has given birth to “Food Sport” by providing a level playing field, a fair judging system, a creative culinary fest, and a process that allows the culinary elite to show their chops and earn the respect they deserve. For sponsorship information, contact Larry Weil.